Here’s an exciting, engaging question that’s totally not boring: What’s your favorite local bridge? You must have one. 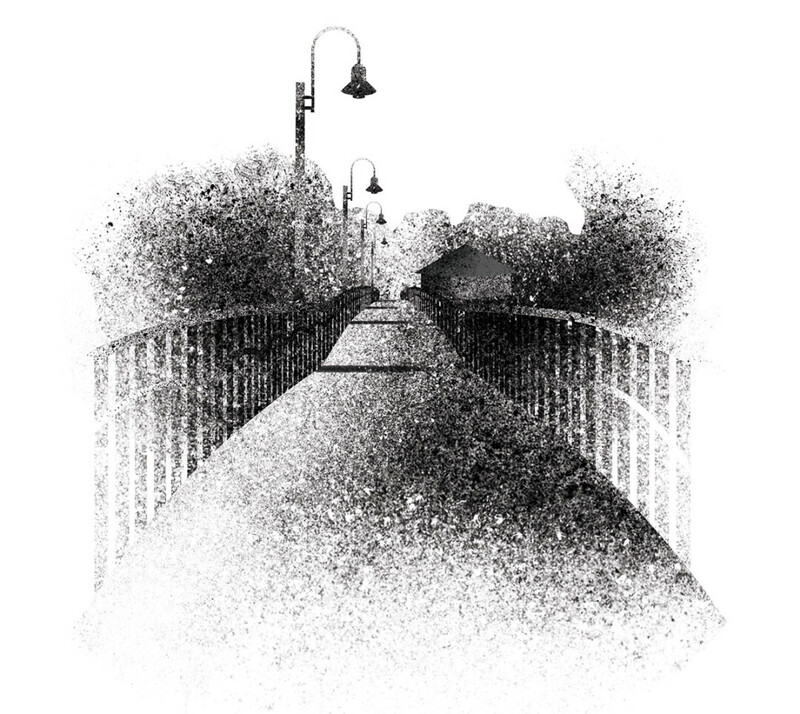 Eau Claire is often called a “City of Bridges” by government officials, townies, and local arts-n-culture magazines such as the one your eyeballs now caress. The moniker “City of Bridges” developed over time because Eau Claire has A LOT OF BRIDGES. I suspect it has to do with all the rivers, of which we also have a lot. So you gotta have a favorite, right? Or is it too hard to choose? The footbridge in Phoenix Park is a solid choice, though its indie cred may be diminished somewhat by its popularity. Home to countless senior portraits, wedding photos, and bike traffic-hindering selfies, this 526-foot expanse gets a lot of play. The footbridge in Phoenix Park is a solid choice, though its indie cred may be diminished somewhat by its popularity. Home to countless senior portraits, wedding photos, and bike traffic-hindering selfies, this 526-foot expanse gets a lot of play. However, with its fantastic old railroad trussing, it creates an iconic backdrop for the park. And last fall’s installation of 172 computer-controlled LED fixtures – capable of 252 million color options – make it the city’s most visually dynamic river crossing. But what about the Grand Avenue Footbridge, right up the river? It’s currently closed for a much-needed resurfacing, which includes the addition of several lookout decks, but people have been crossing the Chippewa River at that spot for 150 years. According to Carrie Ronnander of the Chippewa Valley Museum, the city’s first permanent bridge across the Chippewa was right there – locals built the first version in 1869. Originally a movable bridge able to swing to the side, it afforded passage to steamboats and ... logs. It was rebuilt multiple times, with its current version going up in 1980. What about the Soo Line “S” Bridge across the Eau Claire River by Banbury Place? Perhaps Eau Claire’s most unique bridge-y offering, it was specifically designed in a curvaceous manner to connect railroad tracks running parallel on either side of the river, eschewing the sharp turns of a boring ol’ straight bridge. More secluded than our other overpasses, locals are attempting to make it a “love lock” bridge, fastening padlocks onto the railings and tossing the keys into the water in a romantic gesture of vandalism. Speaking of romantic stuff, consider the High Bridge, just north of Madison Street. Originally constructed in the late 1800s as part the “Omaha Road” rail line, it reaches 900 feet across the Chippewa River. It was closed to rail traffic in 1992, but we revamped and reopened it as a pedestrian bridge in 2015. Off the south side, you see the Mighty Chip’ a-flowin’ into downtown Eau Claire. The sheer height of the bridge generates fantastic vistas, but does the “High” Bridge stand tallest amongst its spantastic brethren? Probably not. According to city engineer Dave Solberg, the Hastings Way bridges over the Eau Claire River could be as much as 10 feet higher from the riverbed to the deck. And hey, here’s another super ultra fun fact about the Hastings Way bridges. Before the Eau Claire bypass was finished in 2006, Hastings Way was also U.S. Highway 53 – the most major road to pass through the city, making that overpass pretty important. In fact, the Wisconsin DOT says the stretch of Hastings Way between Highland Avenue and Birch Street – which includes the bridges – used to see 50,150 vehicles drive through on a daily basis. Now, it may be hard to imagine, but that crossing was almost somewhere else. Our fine highway engineers of yore, probably wearing high-waisted slacks and fedoras, had once strongly considered crossing the Eau Claire River at Margaret Street. This was back when the Eastside Hill Neighborhood was better known as the Second Ward, and most of that area was undeveloped. That’s what Brian Blakeley told me, and he recently published the first book in a series called A History of Eau Claire, Wisconsin. (So I believe him.) At any rate, it’s hard to imagine what that area would be like now if a major highway had cut its current footprint in half. Speaking of the Eastside Hill Neighborhood, what about the footbridge in Boyd Park? This sturdy spanner was a sweet suspension bridge for most of its life, with the original incarnation built in 1889. According to some old Leader-Telegram articles Ronnander dug up, it was meant to connect residents and businesses on either side of the water, but it collapsed by 1893. To reconnect the neighborhoods, a new bridge was built over an old water mill dam in 1912. Eventually this bridge was also used by Gillette Tire Co. workers parking on the south side of the river. In the early 1930s, it was replaced by the aforementioned suspension bridge. And though it hung there for another 70 years, it immediately had problems. The bridge was plagued by windy conditions and frightening vibrations, even (as reported by some area boys in 1934) pulling away from its end supports and flying into the air like a giant swing. By 2000, the bridge was slated for demolition. But after much deliberation, a $560,000 grant, and some heavy lobbying from the Eastside Hill Neighborhood Association, plans were made for a new bridge. In 2003 the bridge we see today was constructed 200 feet to the east of the original. We have more bridges, of course, but that’s enough excitement for today. Pick a favorite.